This chest bears the initials “EK” thought to represent the name of Editha Kellogg Moody, the great-great-grandmother of Mary Lyon, founder of Mount Holyoke College. In 1883, the early Hartford collector Henry Wood Erving (1851-1941) found a chest in an old house at Hadley, Massachusetts, and described it as his “Hadley chest.” That name continues to be used today, although joined pieces of this type were made throughout the Connecticut River valley between about 1690 and 1740. Chests such as this one were given to young girls to contain the textiles and other possessions that they would accumulate in anticipation of their marriages. This example is made from two types of wood: pine for the top and back, and oak for the rest. Generally, Hadley chests were painted with bright colors, and this one bears the remnants of black and red pigments. 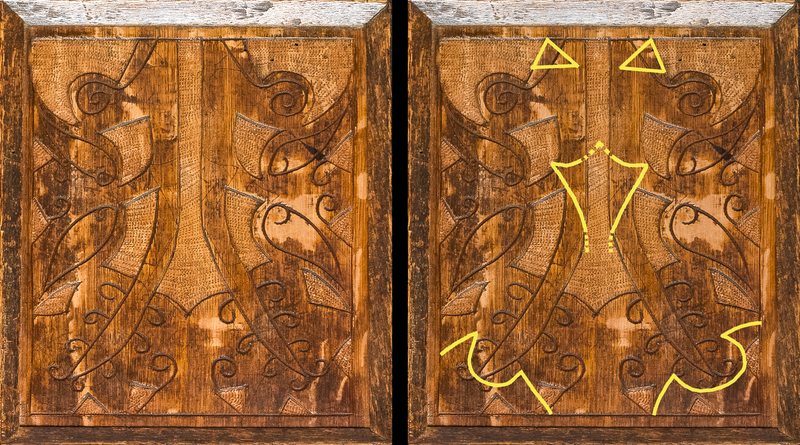 The tulips, hearts, sunflowers, pinwheels and undulating vines that typically appeared on the chests would have been even more prominent in their original painted state.